This order was issued by Gen. Dwight D. Eisenhower to encourage Allied soldiers taking part in the D-day invasion. The decision to mount the invasion was cemented at the Teheran Conference held in November and December 1943. Joseph Stalin, on his first trip outside the Soviet Union since 1912, pressed Roosevelt and Churchill for details about the plan, particularly the identity of the supreme commander of Overlord. Churchill and Roosevelt told Stalin that the invasion �would be possible� by August 1, 1944, but that no decision had yet been made to name a supreme commander. To this latter point, Stalin pointedly rejoined, �Then nothing will come of these operations. Who carries the moral and technical responsibility for this operation?� Churchill and Roosevelt acknowledged the need to name the commander without further delay. Shortly after the conference ended, Roosevelt appointed Gen. Dwight David Eisenhower to that position. By May 1944, 2,876,000 Allied troops were amassed in southern England. While awaiting deployment orders, they prepared for the assault by practicing with live ammunition. The largest armada in history, made up of more than 4,000 American, British, and Canadian ships, lay in wait. More that 1,200 planes stood ready to deliver seasoned airborne troops behind enemy lines, to silence German ground resistance as best they could, and to dominate the skies of the impending battle theater. Against a tense backdrop of uncertain weather forecasts, disagreements in strategy, and related timing dilemmas predicated on the need for optimal tidal conditions, Eisenhower decide before dawn on June 5 to proceed with Overlord. Later that same afternoon, he scribbled a note intended for release, accepting responsibility for the decision to launch the invasion and full blame should the effort to create a beachhead on the Normandy coast fail. Much more polished is his printed Order of the Day for June 6, 1944, which Eisenhower began drafting in February. The order was distributed to the 175,000-member expeditionary force on the eve of the invasion. 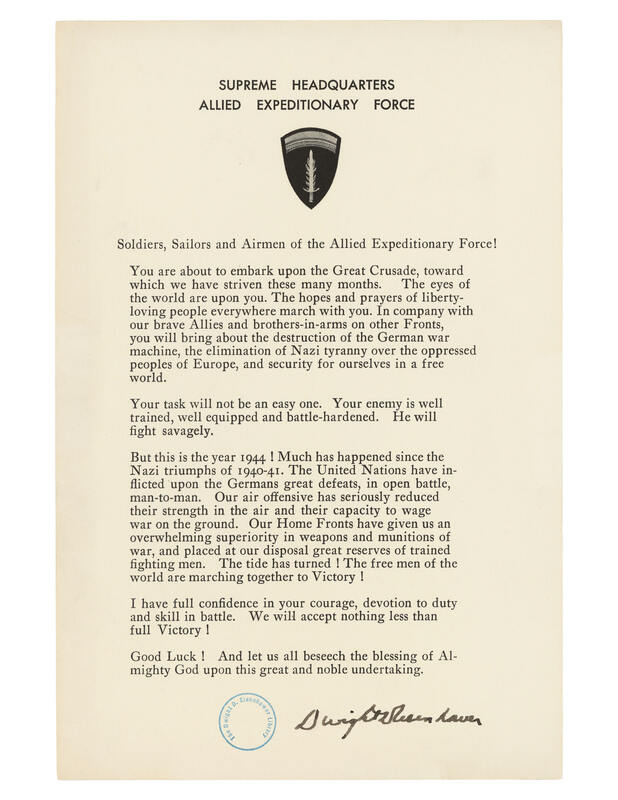 For more information and other documents regarding the D-day invasion, visit the Digital Classroom�s Teaching With Documents Lesson Plan: Message Drafted by General Eisenhower in Case the D-Day Invasion Failed and Photographs Taken on D-Day.